Jamie Elliott is tackled by former Kangaroo Cruize Garlett when the two clubs met at Etihad Stadium in round 21 last year. Collingwoodfc.com.au has looked into the archives to extract the key facts and figures from Collingwood's 153 meetings with North Melbourne since the Roos joined the VFL in 1925. North Melbourne: Goldstein, Harvey, Thompson, Petrie, L.Delaney, McMahon, Hansen. - Collingwood and North Melbourne made history when they fought out the final Under-19 Grand Final back in 1991. The two teams met out at Waverley Park on Grand Final day in the final match in the competition's history before it made way for the TAC Cup. The Kangaroos overcame Keith Burns' Magpies by 38 points, winning 14.15 (9) to 8.13 (61). - Five years earlier, the Magpies had enjoyed success against the Roos in the Under-19 Grand Final. It was the last of the club's four Under-19 premierships. Captain Jason Croall kept Mick Martyn quiet aft full back and led Collingwood to a 16-point win. The final score was 12.11 (83) to 9.13 (67). 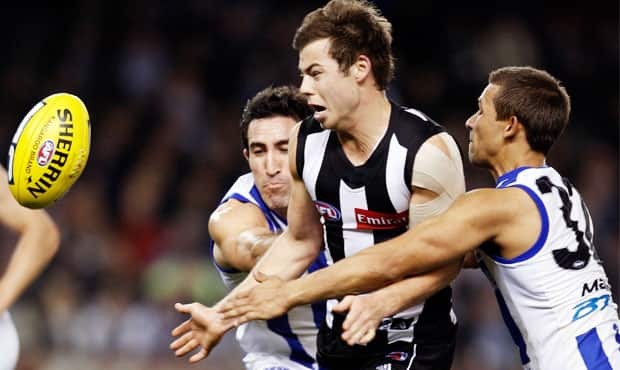 - The last time Collingwood met North Melbourne in round one was back in 2007. The match is famous for Kangaroo Shannon Grant's poster from point blank range with only minutes remaining. Grant had received a contentious 50m penalty after it was deemed that Heath Shaw had held him for too long after marking 50m out from goal. Inexplicably, he was moved only 40m closer to goal. Even so, players like Grant usually eat those sorts of goals for breakfast. But on this occasion, he kicked the ball too hard and hooked it onto the right goal post. The kick allowed Collingwood to cling to a three-point win with James Clement starring at half back. - Collingwood's last match on Easter Sunday was played against Carlton in round two, 1999, when the Blues won by 29-points. That match is famous for Nathan Buckley's broken jaw. Early in the match, Buckley was bumped by Carlton's Justin Murphy and cracked his jaw. The new Collingwood skipper was to sit out the next five rounds as his team slumped to last on the ladder.